Why did Hagrid live in a hut? Hagrid lived in a hut away from the rest of Hogwarts. To my best recollection, the other professors lived in Hogwarts castle proper. So why was he in a hut? Not good enough for a proper room in the castle? Liked being around magical creatures and there were more critters outside the castle than in it? Broke some rule? Please post answers with quotes from canon sources. His hut may’ve been the intended residence for the gamekeeper. When Harry, Ron and Hermione went down to Hagrid’s hut because he wanted to show him that he got a dragon egg, it’s referred to as “the gamekeeper’s hut”. This could mean one of two things - that it was the hut that the Hogwarts gamekeeper typically lived in, or that it was the hut that Hagrid (who also happened to be the gamekeeper) lived in. Though it does seem that teachers can keep their living quarters if they change positions, since Snape keeps his office after becoming Defense Against the Dark Arts teacher, there do seem to be certain living quarters that commonly go with specific staff posts. In addition, Hagrid remained the gamekeeper even when he also got the position of Care of Magical Creatures teacher. His hut was also close to the Forest, where his creatures were. 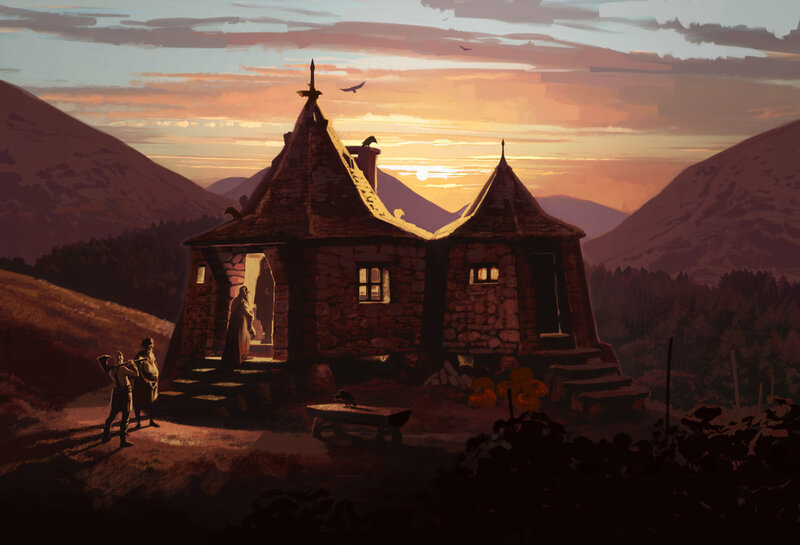 Hagrid’s hut was close to the Forbidden Forest, which was where the majority of the creatures he tended to, both as gamekeeper and Care of Magical Creatures teacher, typically lived. 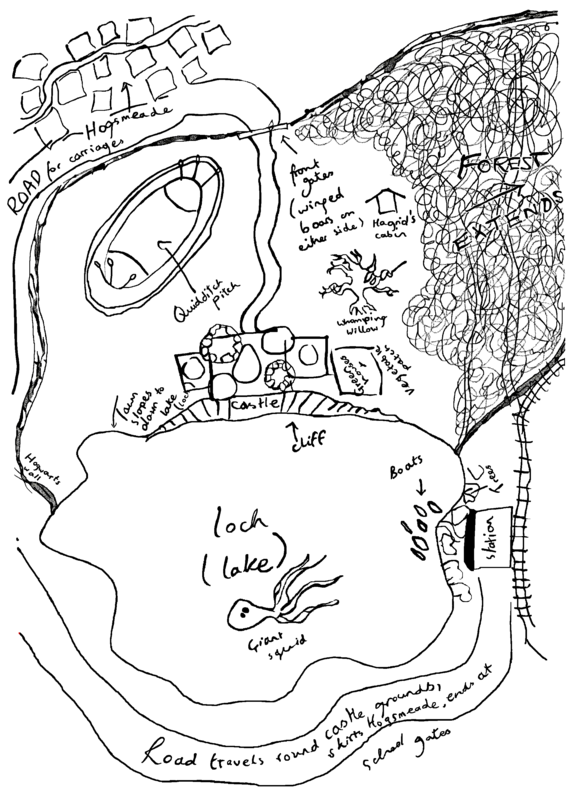 This drawing JKR did of the Hogwarts grounds visually gives an idea of the distance between Hagrid’s cabin, the Forbidden Forest, and the Hogwarts castle. He’s much closer to the Forest than Hogwarts is. In addition, his house is mentioned in the books as being on the edge of the Forbidden Forest, and it seems to be a fairly long walk from the Hogwarts castle to get to Hagrid’s. His house is consistently mentioned as at the edge of the Forbidden Forest. Therefore, it’d be more conveniently located for him than living quarters inside the castle. Since he didn’t live in the castle, he was closer to outdoors, and could easily tend to his creatures and the garden he kept right outside his hut. He couldn’t have a garden so close by inside the castle. His hut gave him more freedom to bring his creatures inside. In addition to allowing Hagrid to live closer to his creatures in the forest, having a hut outside the castle gave Hagrid the freedom to bring his creatures inside with him. Fang isn’t even the only creature he brings in his hut - he brings more unusual creatures inside as well. “A sudden sound from the corner of Hagrid’s cabin made Harry, Ron and Hermione whip around. Buckbeak the Hippogriff was lying in the corner, chomping on something that was oozing blood all over the floor. It’s unlikely the rest of the staff would tolerate this in the castle. Fluffy was inside, but he was there for a purpose, so would be an exception. Hagrid’s creatures also had a certain level of mess along with them that would likely be frowned upon in the castle itself. When Buckbeak was inside with him, Hagrid also had something that dripped blood on the floor and dead ferrets to feed him with. In addition to the legal creatures Hagrid allowed inside his hut that would likely be unwelcome inside Hogwarts, Hagrid also had some illegal creatures which he hid and took care of in his hut. It would be much harder for him to hide and foster especially his more questionable creatures if he was doing it inside the castle surrounded by the other staff members, and even the legal ones probably wouldn’t be welcome inside the castle, since no one wants blood and dead ferrets inside. It’s almost certainly not that he was too big to fit inside the castle. The reason Hagrid doesn’t live inside the castle almost certainly isn’t because he just won’t fit, as Hagrid is seen inside various parts of the castle. Hagrid is able to get to and fit in the library, as Harry and Ron see him there, so he’d fit in the library itself as well as the path to get there. He’s also able to fit himself and a Christmas tree into the Great Hall, and he’d therefore fit (with an additional tree) in whatever path he used to get the tree and himself to the Great Hall. Hagrid’s size doesn’t seem to be any particular obstacle to his ability to get around inside the majority of the Hogwarts castle, so that likely wouldn’t be why he doesn’t live there. Hagrid was employed as Gamekeeper and Keeper of Keys and Grounds of Hogwarts (even when he became a professor, he retained these jobs). A gamekeeper (often abbreviated to keeper) is a person who manages an area of countryside to make sure there is enough game for shooting, or fish for angling, and who manages areas of woodland, moorland, waterway or farmland for the benefit of game birds, deer, fish, and other wildlife in general. Typically, a gamekeeper is employed by a landowner, and often in the United Kingdom by a country estate, to prevent poaching, to rear and release game birds such as common pheasants and French partridge, eradicate pests, encourage and manage wild red grouse, and to control predators such as weasels, to manage habitats to suit game, and to monitor the health of the game. Now, you can see how important it is for a Gamekeeper to stay on the grounds 24x7 to monitor the habitat. You might not be living inside the castle, but you’d be close enough to enjoy all the benefits of Hogwarts life: a Christmas feast, the magical sky in the Great Hall or just a bit of company; it’s all within a short walk. The lake would be close by for swimming or lolling about in the sun, and the forest would be on your doorstep should you be feeling brave – watch out for the spiders though. And you wouldn’t have to put up with helpful advice or comical confrontations from the Hogwarts portraits either (we’re talking about you, Sir Cadogan). Well, there's also the issue that he wasn't really treated with the full honor of the other professors in many ways, and that he may have been kept on at Hogwarts as one of Dumbledore's many good deeds. If you recall, he was expelled from Hogwarts, and had his wand snapped, so his reputation was stained, comparatively. I'd imagine another part of his reason for not staying in the castle is that he wasn't on the same footing as the other professors, and that he was looked down in some ways as a disgraced, expelled wizard. The obvious other example that could serve as counter evidence here is that Filch is even allowed to stay in the castle, but that Hagrid is the only formerly expelled student on staff there (afaik). These points are in addition to his obvious guardianship of the forest, plus his own half-giant blood, naturalistic attitudes, and the fact that he's literally a Groundskeeper, as @user931 did a great job of relaying. "Oh well – I was at Hogwarts meself but I – er – got expelled, ter tell yeh the truth. In me third year. They snapped me wand in half an everything. But Dumbledore let me stay on as gamekeeper. Great man, Dumbledore." "Only the Transfiguration teacher, Dumbledore, seemed to think Hagrid was innocent. He persuaded Dippet to keep Hagrid and train him as gamekeeper. Thus, Hagrid went straight from being a student at Hogwarts to being the gamekeeper (or gamekeeper-in-training). As a student he had undoubtedly lived in the castle. But if he would have retained his lodgings in the castle after his expulsion (or have been given separate lodgings in the castle), there would be nothing to distinguish him from any other student. He would simply be another 13 year old boy in the castle. By putting him in a hut on the grounds they are actually removing him from Hogwarts. They are clearly marking him as a non-student, as an expelled student, as an outcast. To take this a step further, they may have even forbade him from entering the castle altogether as part of his punishment, or to prevent him from getting access to any magical education. And once he lived in the hut he never bothered to move back to the castle, even once he was older and the original reasons for his banishment might no longer apply. Thus, it is possible that the reason why Hagrid lived in a hut was not because of his job, or his personality, or anything like that. It may have simply been the result of the circumstances in which he was removed from Hogwarts and appointed as gamekeeper. 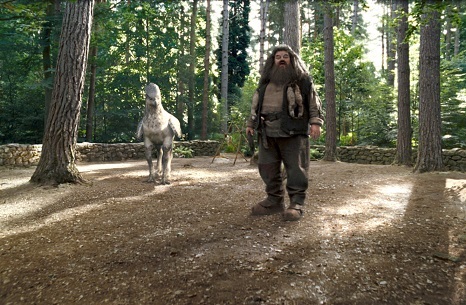 The Location was Ideal for a Gamekeeper Also, it suits Hagrids quirks and his large size. As anyone with a bit of property know-how will tell you, it’s not only about the house itself, you need to consider the location too. In this respect Hagrid’s hut had it covered. Not only did it benefit from the same stunning surroundings as the castle, it came complete with access to glorious grounds with a lake and (slightly terrifying) forest as well. Tucked out of the way from the hustle and bustle of Hogwarts student life, you’d also benefit from plenty of peace and quiet. Here is one about why it might suit Hagrid. Being a half-giant, Hagrid tended to make everything appear on the small side, including his beloved home. For anyone else, it would be perfectly roomy while still being small enough to stay toasty warm and delightfully cosy. Imagine curling up in front of the fire on a cold winter’s night, toasting fat sausages over the flames or boiling up a cup of tea in Hagrid’s enormous copper kettle. I take this quote to mean that it would be for the best that Hagrid has his one Hut because it is more comfortable for him than a small office would be. Another upside for Hagrid is that he had his Garden Patch pretty much at hand. but he took great care of his vegetable patch so you wouldn’t have to go far for fresh ingredients. Furthermore, he could enjoy all of Hogwart's upsides without having to experience its few downsides. Another reason that it would be Ideal for Hagrid to live apart from the castle is that he tended to be fascinated with what most people would call monsters. Everybody loves Hagrid. He was a gentle giant, Harry’s first real friend, and was fascinated by what most people would consider to be terrifying monsters. Hagrid thought his baby dragon was a sweet, harmless creature who loved his ‘mummy’. Now if someone walked into Hagrids office while he was fostering 'Norbert' that might be a bit awkward. 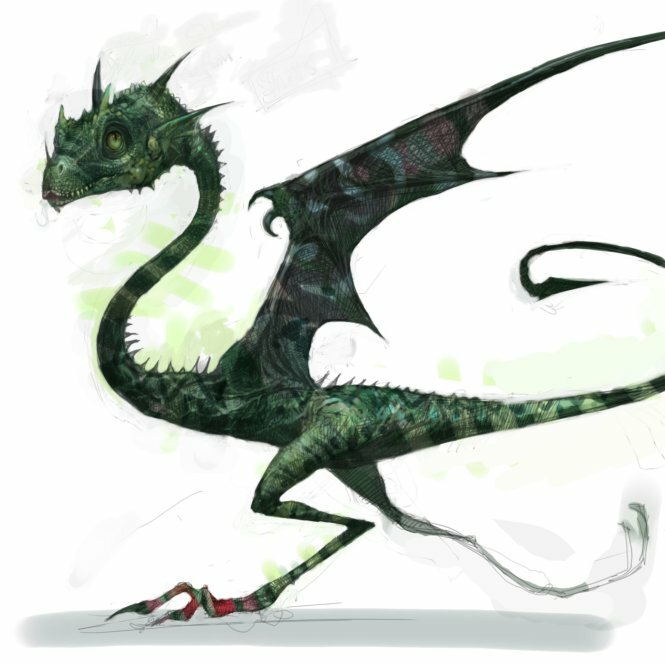 Later in the series he uses his close access to the forbidden forest to make contact with his half brother Grawp. Hagrid was worried about his half-brother being bullied by other giants, so brought him back to Hogwarts. He asked Harry, Ron and Hermione to look after the er, little one, while he was away. So Hagrid living in a hut was ideal for his personal life and for easy access to his duties as Gamekeeper and later as a Care of Magical Creatures teacher. Not the answer you're looking for? Browse other questions tagged harry-potter hogwarts hagrid or ask your own question. 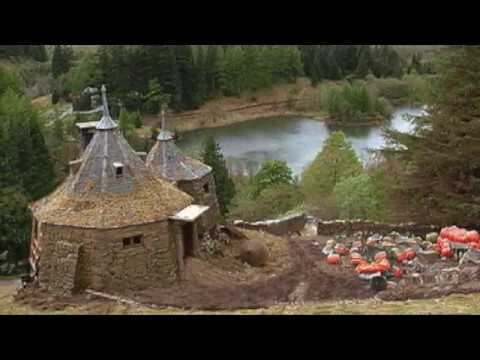 Was Hagrid's hut built specifically for him? What were Madame Maxime's horses that drew Beauxbatons carriage? Why did Fudge have to come to arrest Hagrid? Why did Dumbledore appoint Hagrid as professor of Care of Magical Creatures? Why did Professor Umbridge specifically inspect Harry's classes?